Plan your hiking or backpacking trip well. 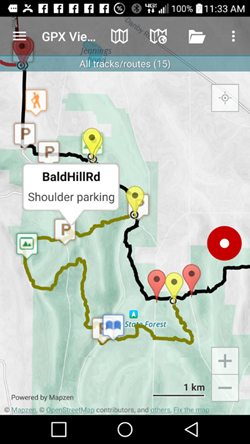 Know where you will be going by studying up-to-date maps and guides, and check the Trail Conditions page of this website for any last minute changes just prior to leaving on your adventure. Have the proper clothing, equipment, and gear for the trip you are planning. Make a trip plan listing where and when you are starting and finishing. If you are planning a multi-day trip, list the location of where you expect to camp each night. Take a copy with you and leave a copy with a responsible person, so the person can alert authorities if you do not return as scheduled. On extended trips, plan to check in every four or five days. Please be sensitive to homeowner privacy when parking where the trailhead is near private property; park well away from driveways. Do not turn around in driveways near homes; find a farm lane or wide shoulder instead. If you are going to leave a car for several days it is best to avoid road-side parking. Inquiring locally or through the local sheriff may provide a safe and legal parking location. In any event, do not leave any valuables visible in the vehicle. Be aware that some of the designated parking areas may be inaccessible in winter. Similarly, “seasonal, limited-use roads” can be impassable in winter, so you may have to hike in to reach the trailhead. If your plans are flexible, these problems can often be solved by choosing a different trailhead to start (or finish) your hike. What will I need for a day hike? What will I need for a backpacking trip? personal hygiene items: toothbrush, toothpaste, soap, towel, deodorant, etc. all items listed for day hike, except small daypack. First aid kit should include more, such as medications taken daily. Should I bring a cell phone? A cell phone can be extremely important in an emergency. However, many parts of the trail have poor or no cell phone reception. Don’t let the fact that you have a cell phone be a substitute for caution and good judgement while hiking. Do I need a GPS? If you know how to use it, a GPS can be fun and useful. 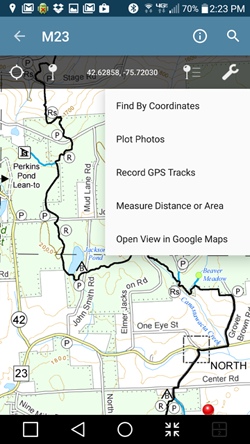 You can purchase tracks of the Finger Lakes Trail system that you can download to your GPS. 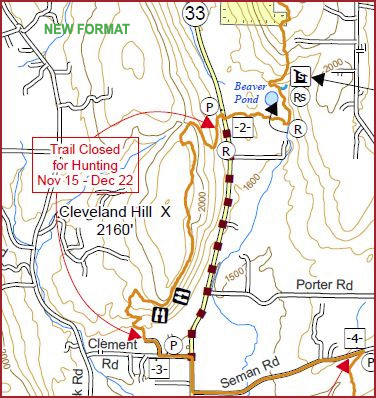 Overnight camping locations on or near the trail are shown on FLTC maps and in the document shown below. They may be lean-tos or other campsites along the Trail or public and private campgrounds near the trail. Campsites are generally primitive with only a fire ring. Water will be available if indicated on maps. In some cases, streams are nearby but not shown on FLTC maps. Do not depend on streams that are not designated as “reliable” on the FLTC map. Areas used for temporary camping and adjacent lands under the jurisdiction of the department must be kept in a neat, clean and sanitary condition. Garbage and refuse must either be deposited in receptacles provided, or removed. Camping is prohibited within 150 feet of any road, trail, spring, stream, pond or other body of water except at camping areas designated by the department. No person may pollute in any manner nor deposit waste material of any kind in or on waters under the jurisdiction of the department. Open camps (lean-tos) may not be occupied by the same person or persons for more than three successive nights or for more than 10 nights in any one calendar year, provided others wish to use such camps. The enclosure of the fronts of open camps is prohibited, except by tying canvas or nylon tarpaulins in place or erecting snow walls. The use of wood, nails, screws or other fasteners is prohibited. The erection of tents in open camps is prohibited. Groups consisting of more than nine people must get a permit from the Department of Environmental Conservation. Contact the nearest Regional Office (their addresses available from the FLTC). Camping is not permitted in State Wildlife Management Areas, except with permission from the DEC. Camping is allowed in New York State Parks at designated sites only. Camping or campfires are not permitted on private land unless a campsite is indicated on an FLTC map. Backpackers are expected to share facilities at any lean-to or campsite with others desiring to use the facility. Groups of more than four persons should provide their own tents when camping at lean-to sites in state forests. Lean-tos and campsites are not intended for long-term occupancy; therefore, backpackers should limit overnight stays to one night. 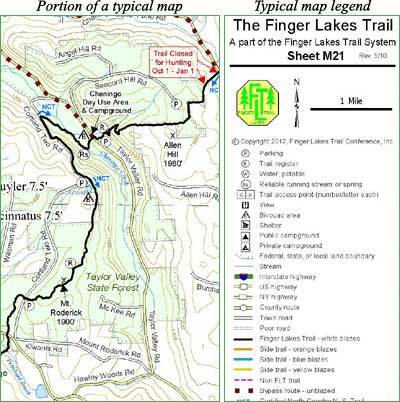 Developed camping locations within a mile or so of the Trail are indicated on FLTC maps. These may be at State Parks or private campgrounds. Such facilities are usually open seasonally from late spring to early fall. Check ahead to find when they are open, what the camping fees are, and where campsites are located in State Parks. The FLTC has addresses of Parks the Trail goes through and of those near the Trail. The Board of Managers of the Finger Lakes Trail Conference has adopted the following policy in order to protect the Finger Lakes Trail and to help assure the enjoyment and safety of FLT users. If you are planning any sort of group event on the FLT, please read this first. Direct any questions to the FLTC Service Center, Executive Director, or FLTC President.